Dr Sheikh Sultan at the Shurooq project launch ceremony. Sharjah Investment and Development Authority (Shurooq) has joined hands with Eagle Hills, an Abu Dhabi-based private real estate investment and development company, to launch real estate projects worth Dh2.7 billion ($735 million) in the UAE emirate, said a report. The duo will work together in a strategic partnership, represented by "Eagle Hills Sharjah Development," a dedicated real estate company that seeks to develop the three projects: Maryam Island, Kalba Waterfront and Palace Al Khan, reported state news agency Wam. It was attended by Sheikha Bodour bint Sultan Al Qasimi, the chairwoman of Shurooq, and Mohamed Alabbar, the chairman of Eagle Hills besides directors of government and private companies and other senior officials. Speaking at the launch, Sheikha Bodour said: "Sharjah is witnessing a distinctive boom in its diversified economy, which has been attracting various investments from business leaders around the world, making the emirate a premium investment destination for tourism and trade, thanks to the leadership of Sheikh Sultan." 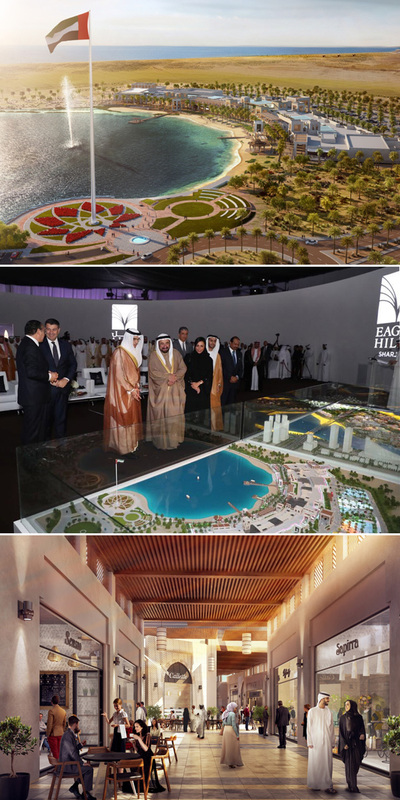 Alabbar said unveiling such prestigious projects in Sharjah, along with partner Shurooq, demonstrates Eagle Hills' commitment to the sustained development of the northern emirates. "These three developments will offer the local community a whole new level of living and lifestyle experiences that will, in turn, attract a larger footfall to Sharjah, boost the economy and increase investments in the emirate," he noted. "We look forward to a longstanding partnership, as we focus on developing these projects to the highest standards of design excellence and build quality," he added. Maryam Island is the largest of the three projects, in terms of both value and area. The Dh2.4 billion mixed-use development will be located between Al Khan Lagoon and Al Mamzar in Downtown Sharjah. The master-planned waterside development will spread across 460,000 sq m, with a built-up area of 310,000 sq m, said the Wam report. Work will commence in the first quarter of this year, with completion due by the end of 2019, it added. The Dh160-million Kalba Waterfront is a master-planned retail development that is set to become one of the most prominent projects of its kind in the East Coast city. The retail project has a gross floor area of 17,000 sq m and a gross leasing area of 11,200 sq m. The mall will be constructed as part of the Kalba Eco-Tourism Project, said the report. Work on the Kalba Waterfront will begin in the first quarter for completion in the third quarter of 2019. Palace Al Khan will be the first luxury waterfront resort in the heart of Sharjah city. Overlooking the Arabian Sea, the Dh120-million five-star seaside hotel will extend over 66,300 sq m. It will offer 87 hotel rooms, two two-bedroom units, nine one-bedroom units and 76 studios. Address Hotels + Resorts, a premium luxury brand by Emaar Hospitality Group, will manage Palace Al Khan, said the Wam report. Work will begin on the project in the first quarter and is set for completion in the first half of 2020.